Traders in the seaside towns here in East Kent are being hit hard by this summer's terrible weather. Recently I was asked to do a cartoon to accompany a newspaper article on that subject, above. 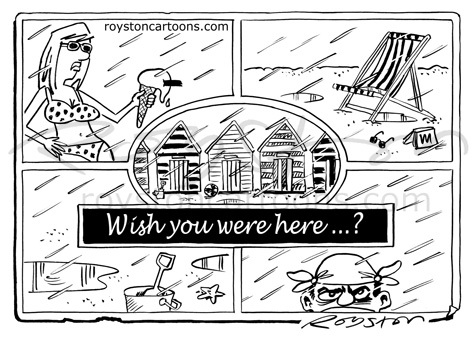 Another rain cartoon of mine (I seem to do a lot this days!) was lifted by Time magazine for this blog post. This shows that it's not just small sites that use cartoons without asking. Obviously I'm glad that they have credited me and written about the cartoon, but I prefer it if people ask first before reusing cartoons, as clearly stated under Cartoons for You in the right-hand column, as there may in some cases be a fee involved.